"The TK-75?" - "The Tin Box" or "The Lunchbox"
".....It never had a TK number -- it was just the "tin box" or "lunchbox" camera. It got a "Newsmaker" logo for a photo shoot and demo for RCA and NBC brass prior to the formation of the TK-76 project team. That camera used 2/3" "TIVICON" tubes -- a silicon-target vidicon made by Texas Instruments because Plumbicons were not yet available in that small size. The silicon target was drifty but sensitive (especially to IR!) The sync generator was a potted unit about the size of a bar of soap, made by Nichicon -- all TTL inside apparently, since it ran hot and made lots of RF noise. 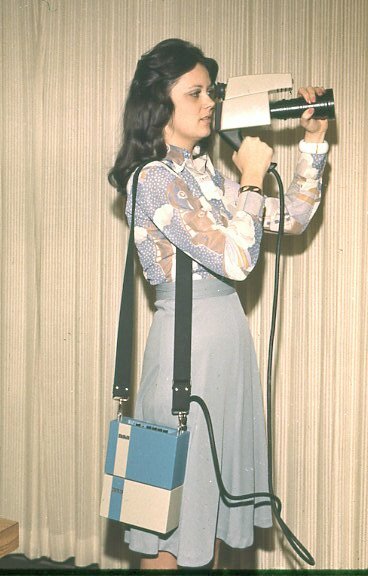 The power supply was external to the camera, worn on a belt with the battery (a 12V motorcyle battery) -- it was designed by an outside vendor and ran at half horizontal rate (synced) I remember that you had to push a "start" button to get it going! 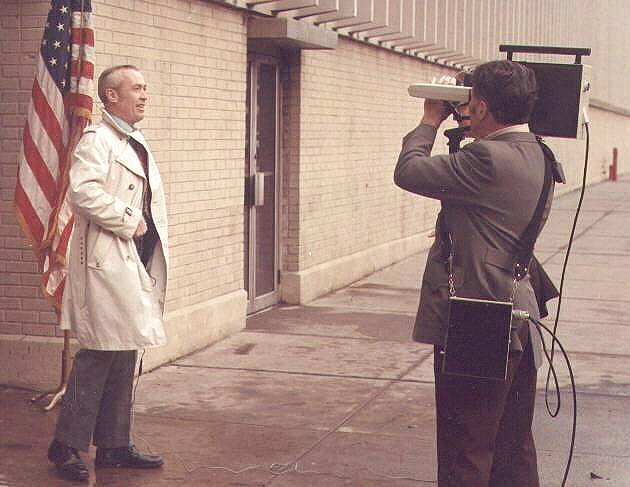 ........"
Thanks to Mark Nelson of Westoboro, MA, one of the design engineers at RCA Camden 1972-1979, who supplied this background information about the camera. Mark was one of the many design engineers who worked on the TK-76, TK-760, and the TK-47, and was in Sid Bendell's Advanced Development Group that built this prototype in 1974-75. 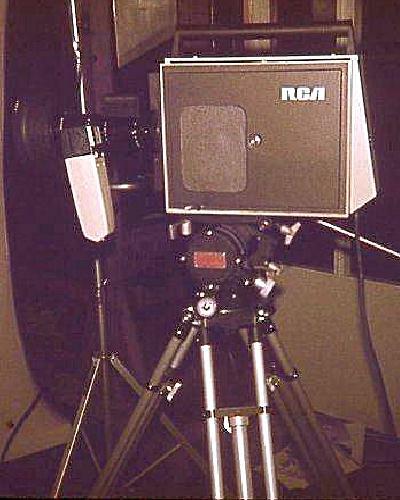 Here is an RCA Styling Department photo of another concept of what the portable camera could become, demonstrated before it was determined the entire electronics could be packaged in a single assembly. Editor's Note: - As Mark Nelson states above, the term TK-75 was never used for this camera. I simply used the term here as an insider joke in reference to "what do you name this?". If its successor was the TK-76, what do you call this. As readers may have noticed RCA nomenclature for the model numbers always were sequential. The prefix indicates the type of equipment and the suffix the numerical revision of that type. They started with radio equipment, thus BC-1 would stand for an audio "Broadcast Console". When television came along the "B" became "T". TC then stood for "Television Console" for video equipment. For cameras they had to create a different terminology, so the phonetic "K" became the prefix for camera. The 10 series was selected for "Live" and 20 series for "Film". With so many versions of live cameras that evolved the numerical sequences jumped up to the 30s, 60s, the 40s(for color cameras), and TKP-45(for color portable). Later the PK prefix would be designated for low cost "professional" cameras built for CCTV. The TK-76 derived its name from two factors in late 1975. A standalone portable camera would need a new numerical sequence. Instead of starting with a TK-70 model number marketing suggested TK-76 because it would be introduced in the 1976 Bi-Centennial year. (For all you Broadcasting Trivia Buffs - The Japanese manufacturer Ikegami copied that date nomenclature and changed their(Handi-Lookie) HL-33/HL-35 (2 piece) series portable cameras up to HL-77 when they introduced their first single piece portable(followed by HL-78 and HL-79).